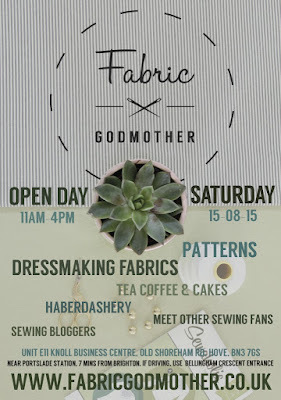 Fabric Godmother Open Day - Come and Say Hi! Hi peops! 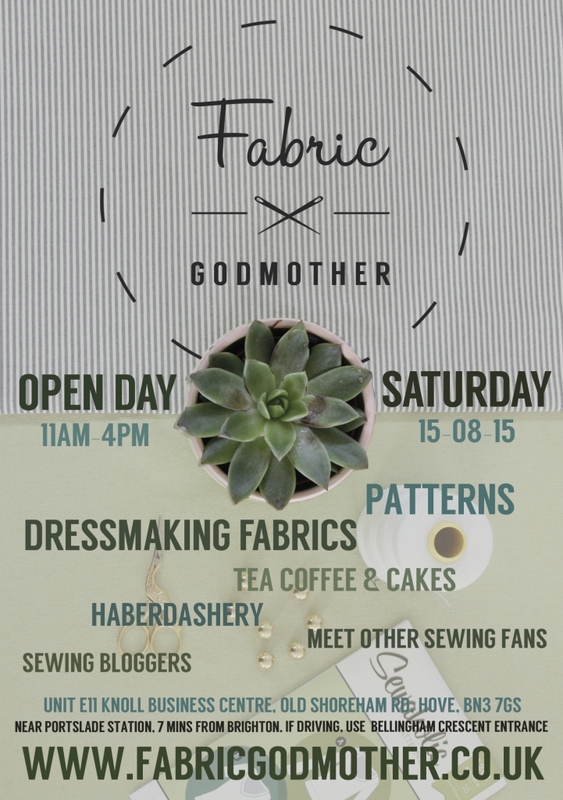 If you happen to be in Southern England on 15th August, then there will be few better places to be than the Fabric Godmother's open day. It's a chance to hang out in their lovely space (a classroom in a former school! I'm obsessed with it), whilst checking out their entire range of fabric, sewing patterns and notions. They'll have a bunch of special offers on fabric that are not online (including some beautiful vintage fabrics) and cake and coffee. I'll be there for most of the day helping out, and there are other sewing bloggers who will hopefully be showing their beautiful faces on the day as well (confirmed's include Rachel from House of Pinheiro and Wendy Ward from MIY Workshop). I don't get out to as many sewing get-togethers as I would like to these days, so PLEASE drop by and say hi if you are able. It's going to be a frikkin' sewing party! What's it meant to be for? The appliqué foot seems to have two main benefits: 1) it is smaller so theoretically more manoeuvrable round angles and shapes than a standard machine foot, and 2) the back of it is raised to accommodate the bulk from a row of close satin stitch. I used the appliqué foot when applying a patch to cover a hole that 'appeared' in Dolores's blouse when she momentarily got hold of some scissors (on her dad's watch, I may add). The patch was a bird-shape, so suitably awkward for testing this foot. I used a faux-blanket stitch rather than a satin stitch, but I definitely had no problems stitching round the shape, which must be in-part thanks to using this little appliqué foot. The point of an even feed/walking foot is that it has a row of teeth that feed the top layer of fabric through at the same rate that the feed dogs feed the bottom layer through underneath. 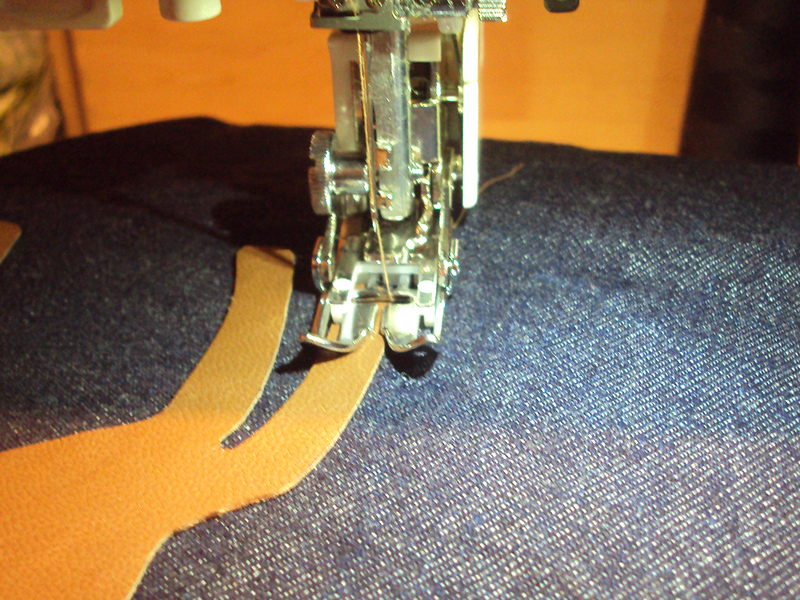 Therefore, there isn't the resistance that a regular machine foot can create to the top layer that can make for shifting and slipping when sewing certain types of fabric. There's a bunch of uses for this foot depending on what type of sewing you're into, but it can be good for super-fine and slippery fabrics, knits, vinyl/leather and for quilting. If you were paying close attention during the last series of The Great British Sewing Bee, you would have seen these being used during the leather jacket challenge. Of all the feet I was sent, this was the one that I was most interesting in. When I worked at TRAID, I did a lot of leather and vinyl appliqués (like this, this and these), and often struggled with the machine foot sticking to the leather/vinyl. I found that a squirt of machine lubrication spray helped a little, but I feared staining the fabric of the garment so was excited to try a new foot. 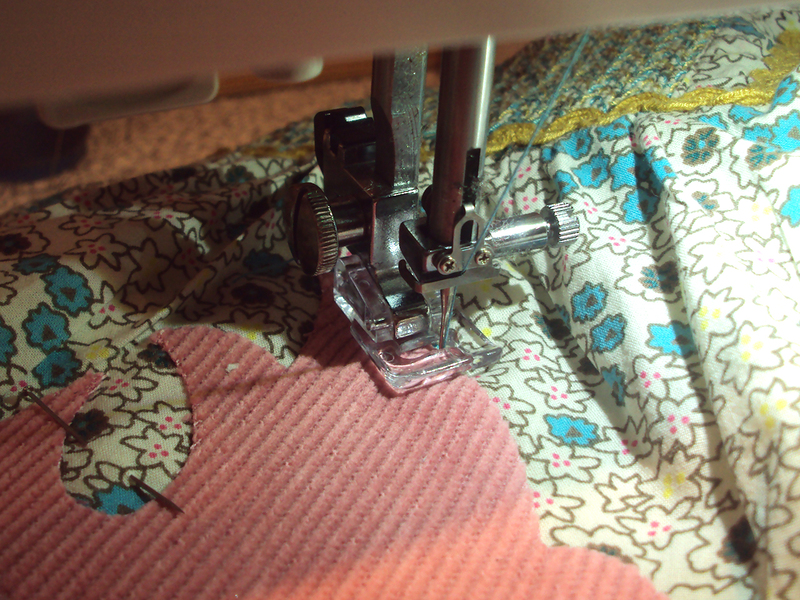 I tried this walking foot when applying the leather fawn shape on this pinafore dress. It's a chunky old foot this one, not as light and nimble as the appliqué foot (see above), and therefore a bit trickier to manoeuvre round an awkward shape. But it was SO MUCH FUN to use and there was no sticking at all. If you have encountered any sticking, slipping or shifting in your sewing projects, I'd recommend putting this foot on your Christmas (or alternative special occasion that is celebrated with presents) list. Another foot related to appliqué (can you tell I've got the appliqué bug back these days?!). 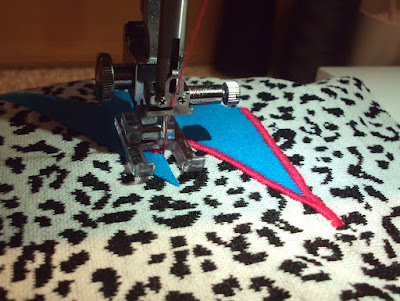 The zigzag foot is made of clear plastic and has a massive gap in the area where the needle goes down, so visibility for fancy stitches or following the edge of something is made really easy. I cracked open the zigzag foot when appliquéing a lightning flash shape onto a little sweatshirt, and I must admit, the huge gap makes it feel really weird to use initially. However, all that extra visibility is excellent. I think back to the masses of appliquéing I used to do in my twenties (cool appliquéing, mind) and think about how much easier it would have been if I could have seen what I was doing a bit more! If you are into appliqué or fancy stitches, I do recommend getting hold of one of these. I will now stop using the word appliqué for the duration of the rest of this blog post. 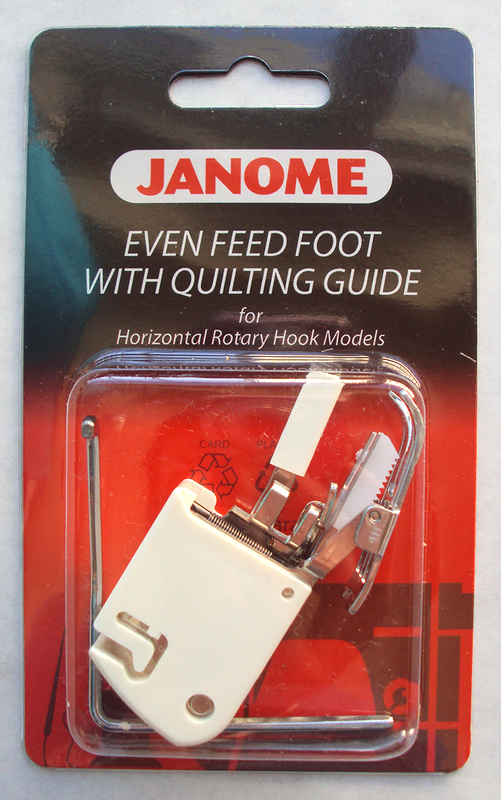 Now what the Janome website won't tell you, is that the zip/zipper foot that comes with a Janome machine as standard is pretty rubbish. So they have this far superior one available. 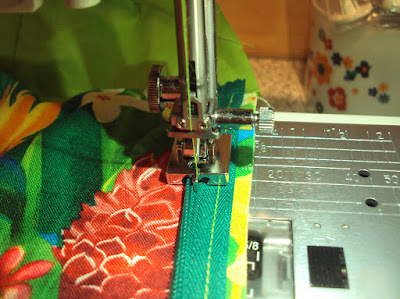 You can see what the standard zip foot looks like here, and basically when it is positioned so the needle goes down the left side of the foot, the needle can't get very close to the teeth of the zip (or whatever other use you are using it for, like making/inserting piping etc.). This superior zip/zipper foot (sorry, I find writing 'zipper' uncomfortable!) is adjustable and can be positioned so you can get really close to the zip teeth or piping, whichever side you need to use. Like the walking foot, it is a screw-on type foot. Hell yes. Check out how close to the piping I got in the picture above. I want to write that buying this adjustable zip foot would be worth every penny, but I am annoyed that the standard zip foot is so rubbish that you have to buy this one. 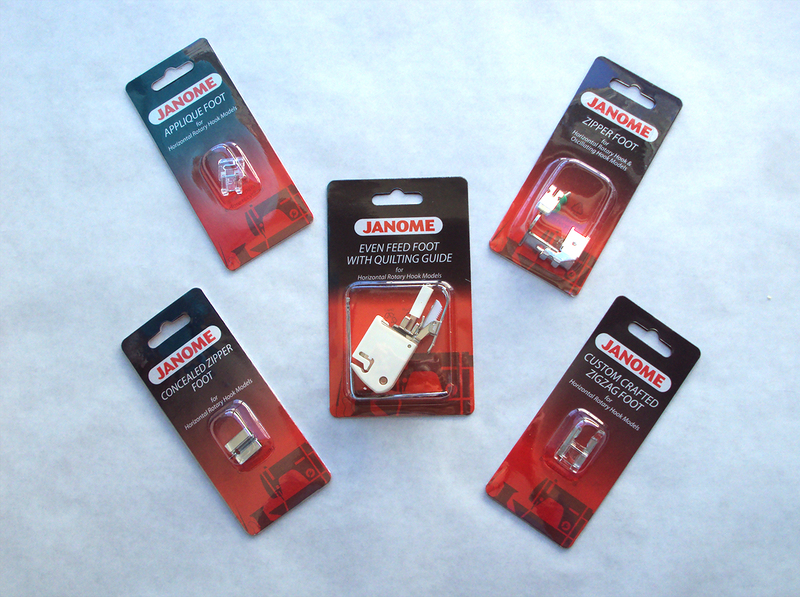 The concealed/invisible zipper foot makes inserting this type of zip much easier and raises your chances of putting one in successfully first time. It has channels that the teeth run through, and a little central nodule-thing that pushes the teeth to one side so the machine needle can stitch really close to them. At various points in my 'career' (I use that term loosely) I have made money from making garments, many of which had concealed zips. I have always used a regular zip foot for putting them in, using my fingers to push the teeth to the side. Having felt that I'd more or less developed the knack, I wasn't sure that a specific concealed zip foot was necessary. I thought it might be a useful tool for teaching others how to insert a concealed zip, but I didn't think I'd want one myself, particularly if you have a decent regular zip foot (see above). But hear me when I say, I was wrong. The concealed zip foot is great. It would be a stretch to claim that it assists a perfect zip insertion every time; a few times I've seen people stitch too close or even over the teeth when using one of these feet. But it definitely makes your concealed-zip-insertion life considerably easier, and if you usually fear or even avoid concealed zips, you should grab one of these if you can. 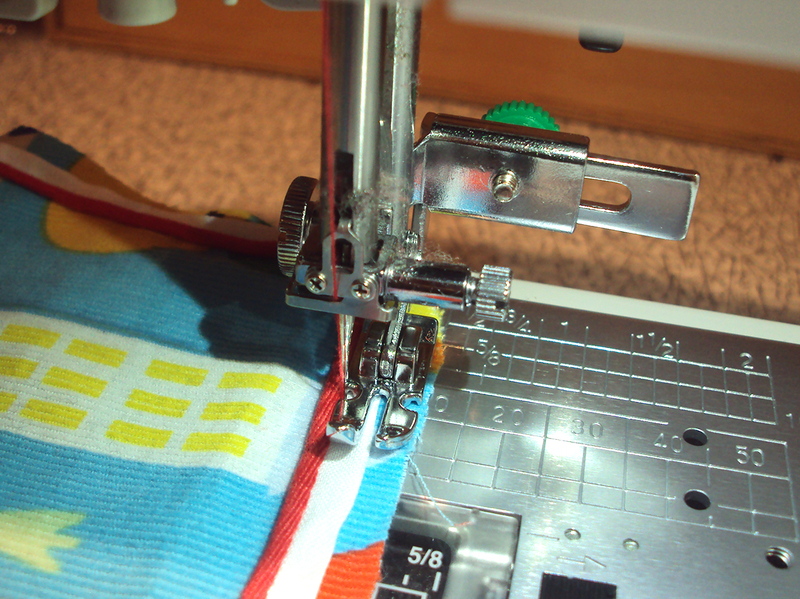 I would recommend that you use a regular zip foot first for basting the zip tape in position (see the yellow row of stitching in the photo above) before using the concealed zip foot to stitch close to the teeth. It's an exciting time for fans of refashioning! 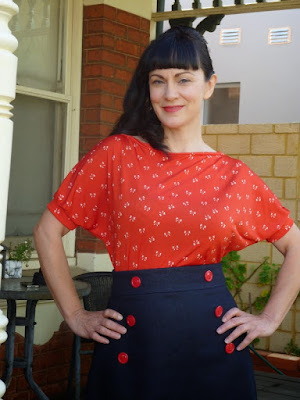 Portia of Makery (formerly Miss P) is currently hosting another round of The Refashioners, a group based challenge where she invites a selection of sewing bloggers to attempt a refashion, and shares their methods on her blog in a bid to encourage more members of the sewing community to have a go at refashioning. Well, this year she has amped it right up! 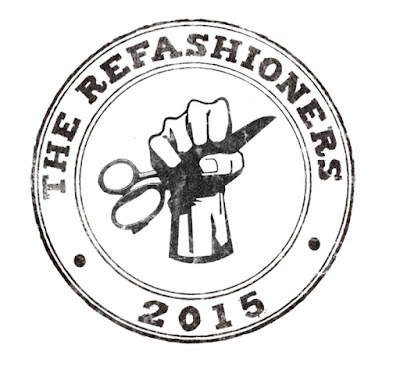 2015's challenge is more refined (this year it's focussing solely on shirts), she has amassed an amazing array of 20 talented and sewing bloggers (you can see the line-up here), AND she's encouraging other sewers to take part with the chance to win some amazing sewing-related prizes. Personally, I was lucky enough to be asked to take part in 2011 and 2013. AND I'm taking part again this year! I'm really excited as it's soooo much fun to be involved in! And preaching the gospel of refashioning is something that is very close to my heart, as Portia knows. Because The Refashioners has grown so much, Portia is no longer sending out the raw materials herself (that would be insane-expensive), so instead most of us are taking part in a swap to provide each other with the shirts. 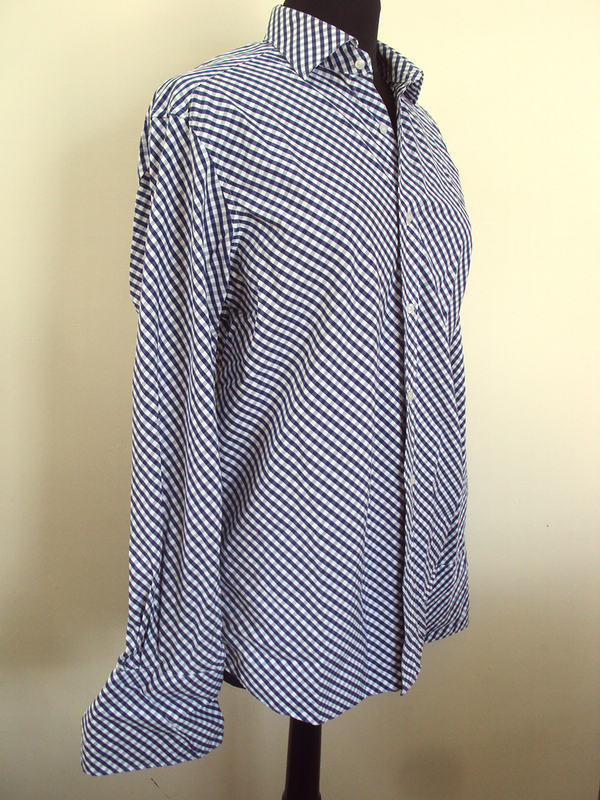 I bought a shirt and sent it to Elisalex from By Hand London, and Sally from Charity Shop Chic (who I interviewed here a couple of years ago) sent me the bias cut gingham dress shirt pictured above. Our deadline is the end of July, and at the time of writing, all I've done is stick it through the wash! However, I just made four sample garments in eight days whilst Dolores was napping or after she'd gone to bed, so I'm not worried that I won't get it done in time! I've got heaps of ideas of what direction to take that I keep tossing about in my head. I can't wait to see what the other sewing bloggers and the other sewers come up with! So, what about you? 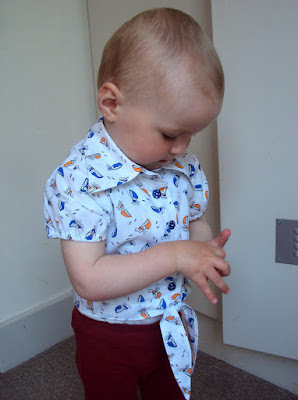 Are you going to have a crack at a shirt refashion? Here's a cute dress that's been waiting in the wings to be blogged about. I'm pleased with it for lots of reasons, which is a relief because making garments that require you to trace the pattern pieces first takes a level of effort that isn't always easy to come by! 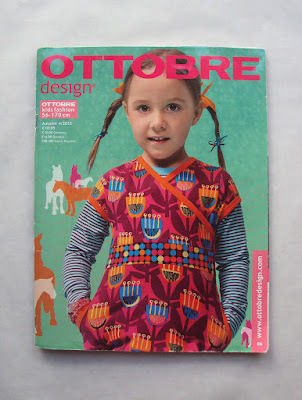 The Autumn 4/2013 edition of Ottobre magazine (pictured above) is one of about three that I own that have now justified their price several times over. I've already used several of the patterns from this edition and have ear-marked more for when Dolores grows into the next size range. So what did I use from it this time? 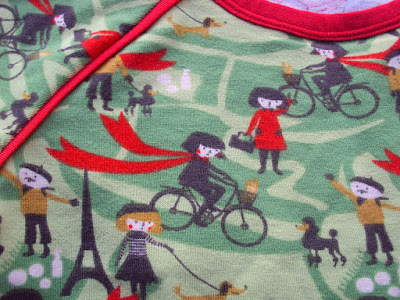 I was for looking something to make from some lovely organic printed jersey that I'd been sent (more on that in a bit). 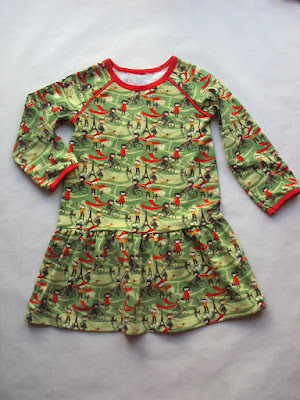 I delved into my expansive Kiddie Clothes Making Pinterest board for inspiration and found this dress pin (from a pattern by Too Sweets patterns on Etsy). It's kind of like a set-in sleeve version of the Field Trip dress I made, but with a more A-line shape. 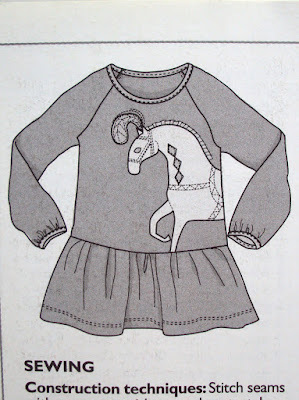 So I started hunting through my Ottobres looking for a basic T-shirt pattern to adapt when I came across the Circus Horse dress (pictured below) from the aforementioned Autumn 4/2013 edition. It has almost the exact silhouette that I was looking for, however it has raglan rather than set-in sleeves. 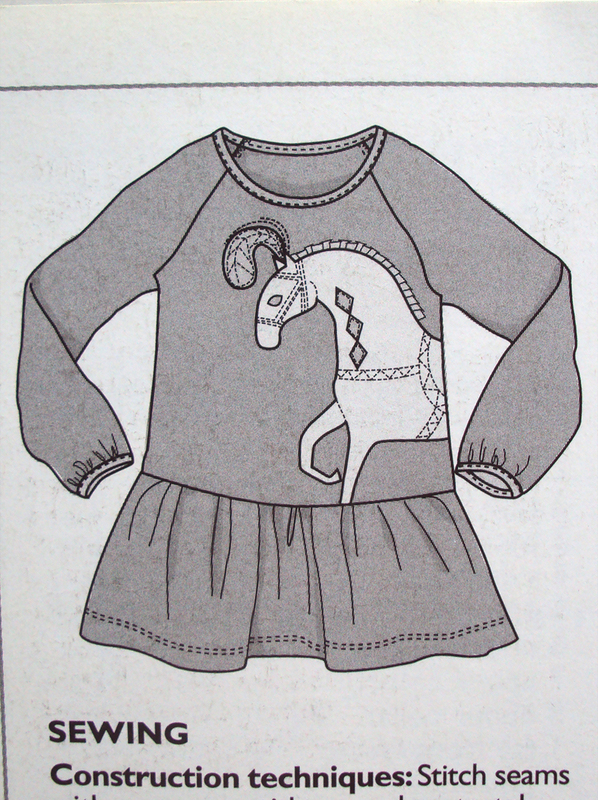 Instead of faffing about adapting another pattern, I decided to go with the Circus Horse dress instead. I made the smallest size (92) which is currently one or two sizes too big for Dolores, but as I've said many times, I'm pleased to have garments for her 'in the bank'. I'm not sure when she'll get to wear it exactly, but I'm hopeful that it'll have a pretty long lifespan. 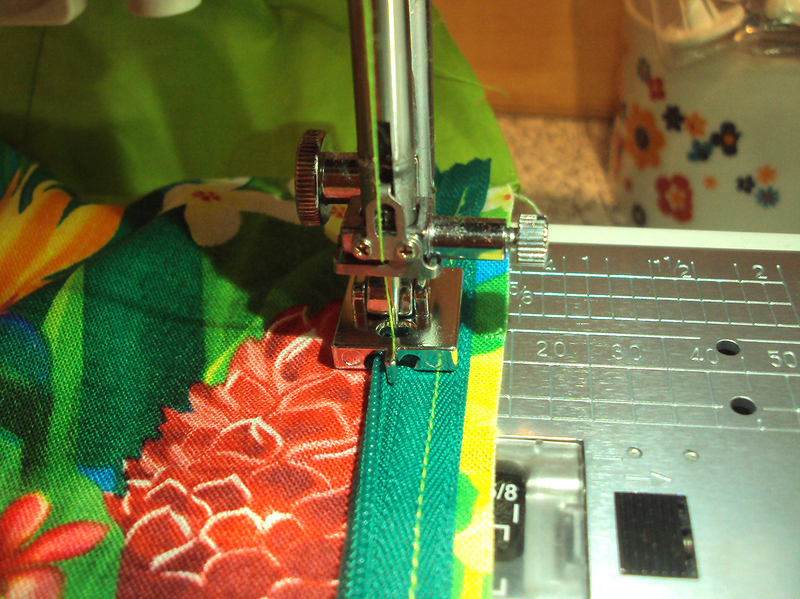 I also added 2cms to the length as she tends to be a bit skinnier than the Ottobre patterns are designed for. 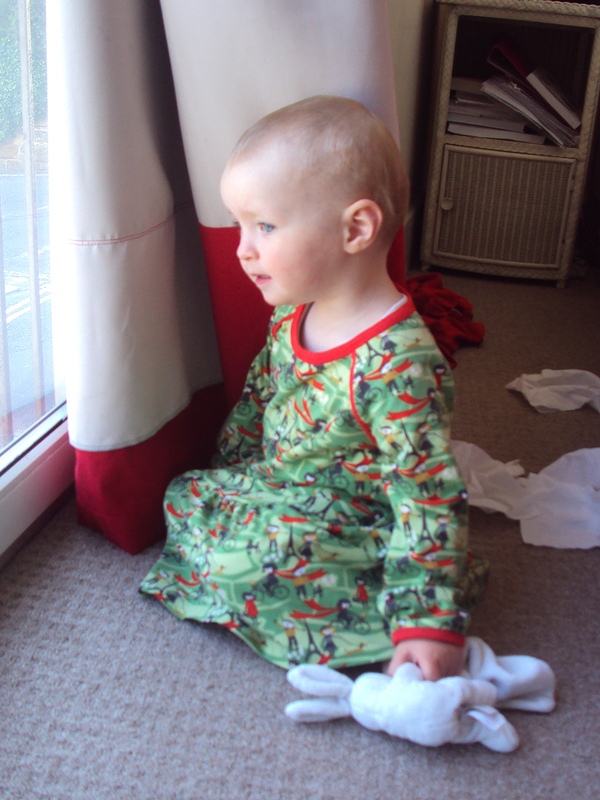 I'm hoping that when it no longer works as a dress, that it'll become a tunic to be worn with leggings. It was pretty simple to put together, although I complicated things slightly by adding some red jersey piping to emphasise the raglan sleeve seams and break up the print a bit. I used my twin needle on the neck binding and cuff binding, and they look pretty profesh if I say so myself (from the outside at least!). Back in March-ish time, I was contacted by myfabrics.co.uk who offered me a choice of free fabric to sew with and review. I took it as an opportunity to further my investigations into organic cotton: to find out what is available out there for home sewers and what it is like to sew with. They had a few organic options on their site, mostly solid coloured jerseys and two novelty printed options. I requested some of the printed stuff as it looked really fun, and they kindly sent it to me (and have been incredibly patient with me and my much-delayed review). When I received the fabric, I was immediately taken with the softness and handle, but a bit disappointed with the colours of the print. In the flesh they weren't as vibrant as the thumbnail on the site. I can't link to it because it is not currently available, although they have many MANY other amazing non-organic novelty printed jerseys currently in stock. WHY AREN'T THE ANCHOR DESIGNS PRINTED ON ORGANIC COTTON?! Riddle me that. This organic cotton jersey was lovely to cut and sew with, and the weight is perfect for a jersey dress, but also probably for a T-shirt or leggings. The softness that seems to be a feature of (all/most?) 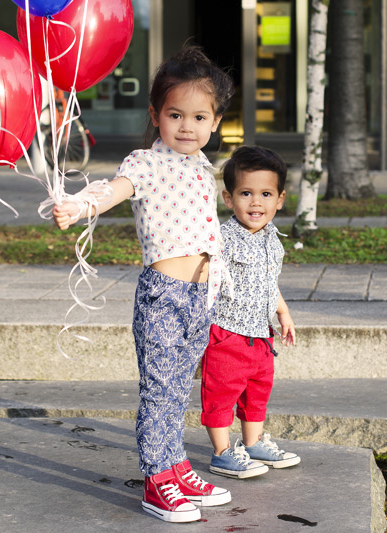 organic cotton is ideal for children's clothing, and the 5% elastane content in this particular piece should aid stretch-recovery and movement for a crazy toddler. I can't comment on how it launders after repeated use, because this garment is still too big (as highlighted in these last two photos!) and it hasn't needed to go through the wash yet. As far as I can tell from a garment that is yet to be in regular rotation, this seems to be a real success. I love the pattern AND the fabric, and I guess it's in the eye of the beholder as to whether they are a good pairing. I definitely plan to use the pattern pieces again, and maybe make 3/4 length or short sleeved versions as well in lighter-weight knit. And when my stash has run dry of knit, and if the charity shops aren't turning out viable garments to harvest it from, I'll definitely consider buying organic jersey/knit fabric in the future. Although I'll make sure it has the GOTS (Global Organic Textile Standard) certification so conforms with standards at every stage of manufacture. 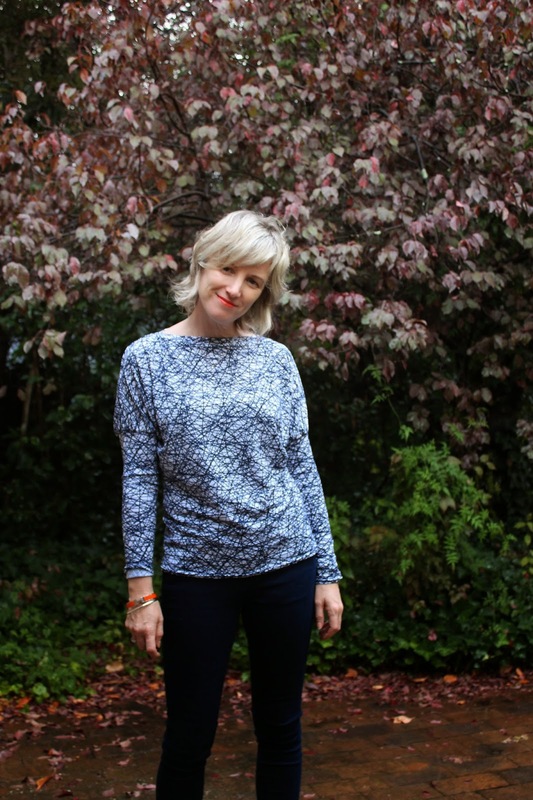 The Dolores Batwing Pattern: Prints! Way back in November last year, I blogged about some of the fabulous creations that had been springing up made from my Dolores batwing pattern. The garments that featured in that post were all created in solid (plain) fabric. 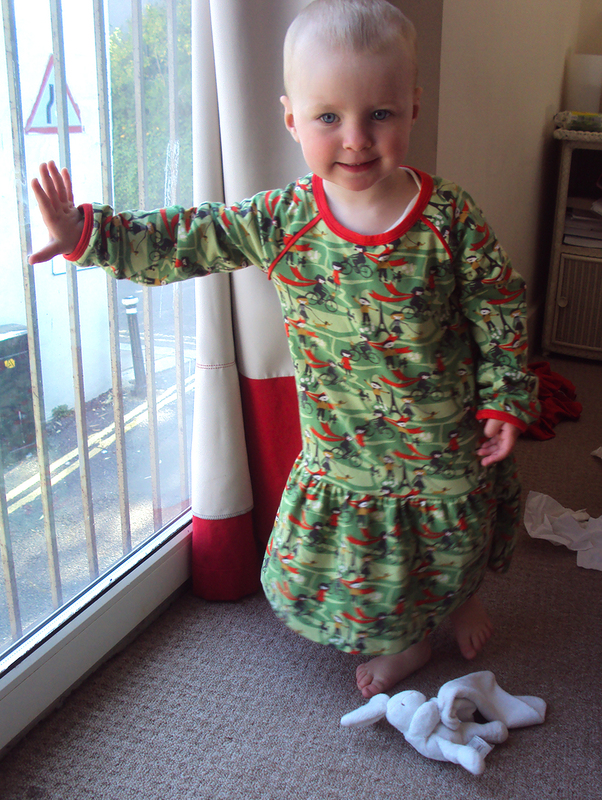 Today I'd like to share some more Dolores batwing garments, this time showing how fun the pattern can look in prints! Super-chic French sewer Sara made a killer 70's style dress with the short sleeved option (pictured above). She even added a thin self-belt to cinch in the waist slightly. I love the autumn tones of that beautiful fabric, it really suits her colouring. Kirsty from Top Notch displayed some true genius by parring the Dolores pattern with this incredible squiggly-print jersey. 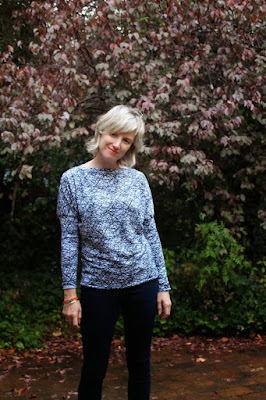 Her long sleeved top version of the pattern is quite possibly my favourite ever! WAIT! Here's another contender for the title of 'Best Dolores batwing creation'. Who couldn't love this whole damn outfit created by Betty Stitchup?! Dolores batwing top + Delphine skirt = Dolphine! Go bold or go home! That's what I take away from Scruffy Badger's phenomenal Dr Jackobi-inspired hawaiiana long sleeved version. That turquoise really pops, doesn't it? It was so tricky to pick just four of the printed fabric versions of this pattern that I've seen so far. But if you like to see more, please check out my dedicated Dolores batwing pattern Pinterest board. Also, if you have made a version of this pattern that I may not have seen yet, PLEASE leave me a link or email me a pic (sozoblog (at) g mail dot com). Agh! I may love this little garment too much. Cute little retro style? Check. Nautical vibes? Check. Worn by my naughty little scamp? Check again. I have a couple of people to thank for the materials that allowed me to make this, and a giveaway as well so you may want to stick around til the end for that. A bunch of months ago, I was lucky enough to receive two copies of children's sewing pattern magazine B*inspired's 4th edition. One was for me to get my grubby mitts on, and a second copy it to be given away. 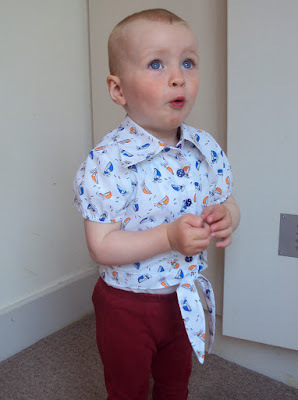 This edition is full of sewable Spring/Summer styles, but there was one that I had to make. 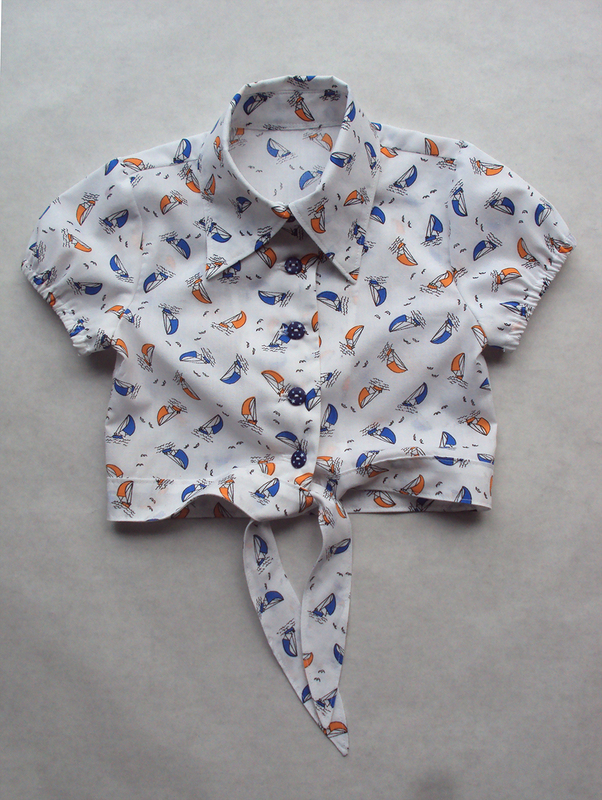 This little tie-front blouse has a retro 1950's bowling vibe that almost demands a novelty print and sweet buttons. Who am I to deny it?! 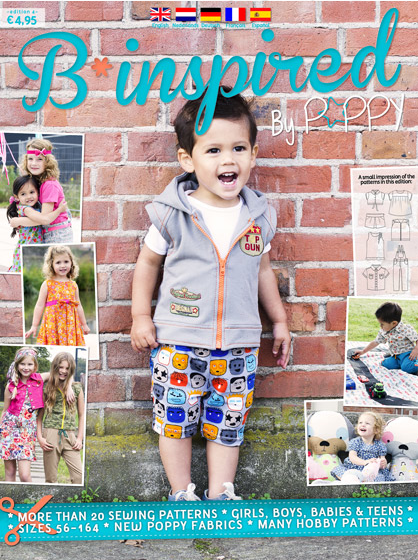 B*inspired is created by the same Dutch team who make My Image womenswear pattern magazine (that I wrote about here). I would say that all the pluses and minuses that I found with My Image also apply here. Speaking positively, from what I can tell from making one pattern from each, the patterns seem well drafted, with some very wearable styles, IMO. The magazines themselves are beautiful and printed on lovely paper. The pattern sheets (from which you trace off the pieces required) are nice and clear, and not overcrowded like the Burdastyle magazines' pattern sheets are. They feature photo shoots that show the garments off well and definitely made me want to sew a good number of them. With all those lovely patterns included, the magazine is excellent value at only €5.95. However, the negatives are also true: the instructions translated into English were confusing at times, and seemed pretty sparse generally. 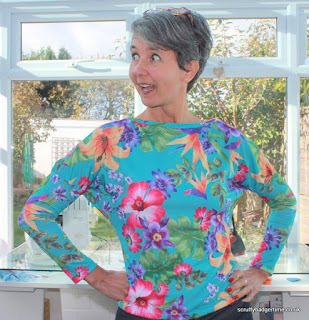 I felt confident in choosing this blouse pattern to try because it was one of only two patterns included that showed some step-by-step photography. However, even with this additional assistance, it wasn't enough to prevent me fluffing up and having to crack out the quick-unpick (AKA seam ripper). Plus there was some potentially-useful information missing, like any indication of where to position the buttons/buttonholes, or how long to cut the elastic for the gathered sleeve hems, which made the project a bit more taxing than this bleary-eyed sewing mama felt really comfortably with. I can imagine that it would be a frustrating experience to try making this blouse without having made any blouses or shirts before (and in my case, that apparently still wasn't enough to help me through without mistakes!). Despite all it's awesome points, unfortunately it would be hard for me to recommend this magazine to anyone who didn't have a number of years of sewing experience and quite a few completed sewing projects, under their belts. My one other small gripe is with the sizing. I traced off and made the smallest size (92), which is a full two sizes bigger than Dolores is currently wearing (according to other sewing pattern magazine sizing and most mass-produced second-hand stuff she has). I expected this to fit her summer 2016 but when I got her to try it on, I was really surprised to find that it is almost the perfect size right now. But I have to say, this project was FUN to make! A fiddly little woven garment that will probably only get a few wears (unless we luck out and it ends up spanning two summers), may not feel like the best use of limited sewing time, but it really was enjoyable to make something small and crisp and perfect. 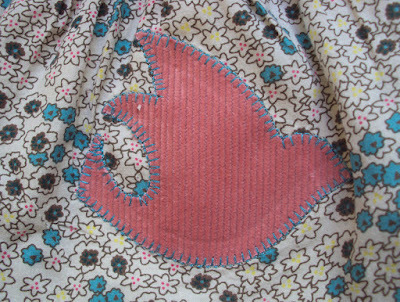 I'd definitely make this pattern again, and have lots of fun picking different cute fabric and button combos. I'd like to make a sleeveless version too at some point. I was sent a small piece of sailboat printed poly/cotton from the very lovely Catherine of Clothes and Sewing a couple of months ago. At first I wasn't sure what to do with it exactly, and I feared that it would languish in my stash. But the stars alined and this pattern presented itself at the right time. The fabric washes easily and presses well, and was the perfect weight for this little summer blouse. 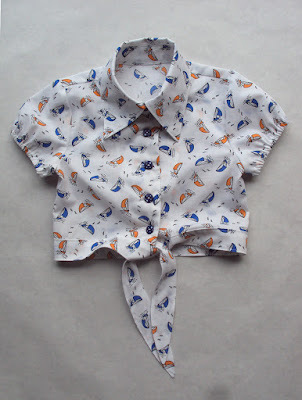 The only thing I regret was not choosing a plain white fabric for the facing rather than using the same printed fabric because the facing sailboats are slightly visible through the front. 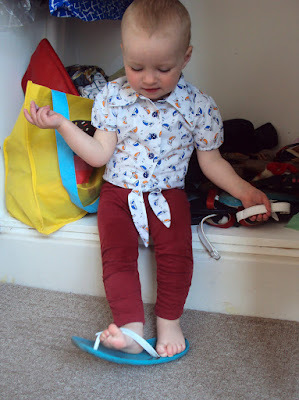 But then, when is a toddler ever still for long enough to really notice such things?! The buttons were from my stash, having originally been given to me by my blog sponsor Maggie from Textile Garden. They are navy blue plastic with tiny white stars printed on them. The navy blue of the buttons is a bit darker than the blue in the fabric print, but I think it is close enough to look nice. So, on to the giveaway bit. This giveaway is open internationally. To enter, simply leave a comment on this post which must include your email address, unless I can access your email address within two clicks of my mouse. No email address, no way to contact you to send you the magazine. If you aren't positive that it can be accessed within two clicks, then leave it in the comment itself. Your email address will not be used for any purpose other than contacting you if you are the winner. Leave your comment by midnight GMT Sunday 12th July 2015. I will pick a winner by random number generator the following day. Good luck!